If you're having questions or problems, don't hesitate to ask for help by following the support link on the right! NEW: Improved compression for files with unnecessary application data. FIX: For some users the app crashed at startup. It does exactly what it promises! 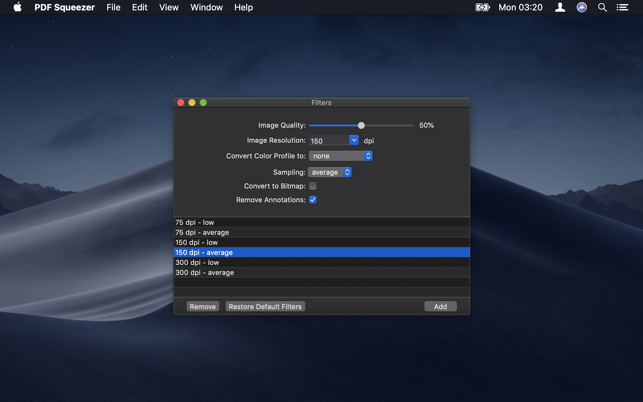 It allows you to choose the resolution of the “squeezed” file. The lower the resolution, the smaller the file size, but the files look perfectly fine even at the lowest resolution settings in my experience. This helps a lot with shrinking the file size of scanned documents. Some scanners will save the file as a PDF, but each page will be several MBs in size as if it were a JPEG or some other image file which takes up a lot of space. I have to send a lot of PDF documents for work and some recipients can’t receive very large attachments by email, so this really comes in handy. Having a smaller PDF file also saves space on your computer and generally makes it faster to open. I have this on my dock and use it all the time. Was uploading .pdfs to the USCIS website for my wifes' citenzinship application and there was a size limit of 6 mbs. Several of the files were large 11 mbs or greater due to several documents included in the scans such as large last will and testament etc…. I was in a rush found this program on the app store and within minutes of install easily reduced the size so we could upload. Great app, EASY to use and allowed simple selection of alternate compression options to see what works best for the end user. This product is also very FAST at reducing large .pdf files. Have used this across multiple jobs, and would consider it esential. Especially when dealing with clients who have limited email bandwidth, or just to make sharing easier. It 100% does what it says it will, and gives options to maintain imate/content quality. I deal with a lot of decks full of high res images and I couldn’t live without this. If I was going to offer any update suggestions, perhaps a more elegent interface (as I am UX professional, that is always my recommendation). It’s a little bare bones…but, def works for what is needed. Don’t fix what isn’t broken!